I’m happy to say that the American College of Veterinary Behaviorists and several CAABs (Certified Applied Animal Behaviorists) have written Merial to complain. The paragraph below is an excerpt from a letter by CAAB Suzanne Hetts Ph.D.
I’ve never met Cesar (would love to) but I suspect that he is one of those remarkable individuals who has incredible presence. You know, one of those people who walk into a room and everyone stops talking to look at them. Gradually the person is surrounded by people who just want to stand next to this person who has… something? But what? What is presence? Good question–Malcolm Gladwell first brought it up to me when we were talking about an article he wrote on Cesar, and he said he was thinking about writing a book about it. I suspect that would be tough. How do you measure presence? Who has it and who doesn’t? No matter what it is, people with it can do all kinds of things that the rest of us can’t. My suspicion (and it’s only that) is that dogs also respond to Cesar’s presence (confidence? being comfortable in your own skin?). That also means that those methods won’t work so well with people who don’t have that quality. Thus, his methods are problematic from two perspectives: they are often based on a misunderstanding of dominance and what it has to do with canine behavior, and they also assume a quality that Cesar doesn’t even know he has, and can’t be replicated. Personally, I’d love to have an open and sincere conversation with Cesar about this. If I can get the podcast up and running, I’ll do my best to try to have him on. This issue will come up often I suspect for me in the next few days, because soon I’m leaving for meetings in Chicago between me, other CAABs and Board Certified Veterinary Behaviorists to find common ground and resolve some conflicts. (Ex: statements by some vets that all behavioral problems are medical problems and can only be diagnosed and treated by veterinarians, whether the vets have had any training in behavior or not. Guess which side of that argument I’ll be on? I’ll keep you posted…). Meanwhile, back at the farm: It’s still brutally hot and humid, I worry most about old Martha, who lungs clearly are still not up to par. More people die of the heat than the cold, especially the elderly with respiratory troubles, and that describes Martha 2.0 to a tee. Willie and I only move the sheep in slow motion (if possible) and only early in the day or late in the evening. 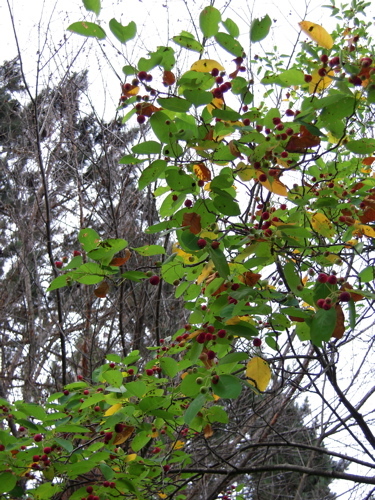 The bird life hasn’t slowed down though, here are the serviceberries by the kitchen window that the Catbirds and Cedar Waxwings are gorging on. And here’s Will, hoping I’ll send him in to get the sheep. Note his ear position, targeted towared me, anticipating a signal I suspect. « Why Don’t Cat Lovers Buy Cat Books? I really hope that the letter-writing campaign helps change Merial’s mind . . . although if they’ve already invested in advertising and production of DVDs, I doubt it will. All we can do, as positive trainers, is reinforce with everybody we talk to that relationships with our animals are key, and that behaviours are deeply affected by how we treat and deal with our companions. Like you, I can appreciate the basic tenets of Cesar’s teaching, including exercise and consistency. That being said, his aggressive and dominating approach is much more than I would ever use on any of my dogs or my students’ dogs. There are still WAY too many people that are buying into dominance theory, and all of its ugly outcomes. We don’t “beat” our kids into submission (Dr Spock would be horrified! ), so why beat our pets? (I’m using the term “beat” very lightly here, of course). I hope that we can make a difference . . . I’m off to write a letter now! Great article. Thanks. Millan has recommended The Other End Of The Leash among others in his own books, so I suspect he’d loved to meet you, too. I don’t know the man and I’m not an expert in dog behavior, but I do respect anyone who strives to learn about dogs (and most anything else! ), helping others understand and take care of them. Love your photos (past ones, too). Every post is motivating me more to move to the country. Thank you. While I agree with you 100% that Cesar should not have been made a spokesperson for a pharmaceutical company (just not a good match), I do think he is aware of his “presence” and its affect on dogs AND people. The biggest thing I take away from his show and his books is the need for a confident, calm personality. He emphasizes that a LOT – that he is a people trainer, not a dog trainer. He says those exact words many times in his books, and it’s part of the voiceover intro on his show. While I think he does have a pretty good way of working with dogs (most of the time), I think the key to his success is the way he helps people. His clients expect him to perform miracles with their pets, but they don’t realize that the change is all about them and not always about the dog. I think that’s part of the problem though… many people who watch the show tend to only pick up his techniques and try them on their own, without realizing they have to change their mindset first. My rescued border collie/heeler mix sits just like that, with his ears cocked exactly like Will’s, waiting for me to tell him it is ‘ok’ to get the frisbee! Today I saw a Blue-gray Gnatcatcher feeding a Brown-headed Cowbird baby (nearly 3x bigger than the gnatcatcher) which made me think of you & your post from the other day. This review was forwarded to me by another veterinary behaviorist and is possibly the most powerful review of Cesar’s techniques that I have ever read by a person who certainly has the credentials to back it up. I will never forget the human examples he uses, specifically, of “flooding” and “punishing OCD behavior”. I share this review with any of my customers who say they just “Love Cesar Milan and are trying to implement his techniques”. Many dog trainers get the dogs after unknowing owners try his techniques “at home” and fail so miserably that the dog is now labeled “viscious” and is now at risk of being euthanized. P.S. I was not given the publication date of this review so I cannot include it. It seems as if it is pretty recent however, but I cannot be sure. but CM/DW has always acknowledged that he works from INSTINCT, which he has freely stated is not something transferable, and that he arrives to a case with no plan whatever – he works from his gut. since my gut-instinct is frequently diametrically opposed to his tools/techniques, i suspect we have very different GI-tracts, LOL… mine prefers minimal confrontation, maximal elicitation, and LIMA stds. quiet got attention, screaming got sequestered. who is well-known to RG over a toy, bone, food, ____, etc). every crevice of the behavioral history, adds grunge and murk to the clarity we would prefer. as for Merial – the mind boggles. it is a travesty and an outrage. with a vet-behaviorist on their Admin roster, they have NO excuse of ignorance. but this was a *marketing* decision – not an ethical or science choice. Please do be proactive in contacting your veterinarian’s office. Drug distributors provide your vet’s office with lots and lots of promotional material. Request your vet’s office not use the Cesar Milan material. And if any of the staff have an interest in the situation, they can call their local Merial drug rep to complain. You know, I’ve heard about this partnership from about twenty different sources and each of the 20 has a slightly different story. I cannot find ANYTHING on Merial’s site OR Cesar’s sites about this. Somebody needs to do some research and figure out the real story. One site says that the owners will get his Sit and Stay DVD, which is NOT taught by him and is extremely gentle and oriented toward positive reinforcement. This one says it’s the Mastering Leadership DVD. They’re quite a bit different! Here’s what I genuinely appreciate about the partnership deals: Someone in Cesar’s team really knows a lot about products. Everything that he puts his name on is better than the background. Merial makes the safest vaccines and safest flea/tick products. His kibble is made by Castor and Pollux and is genuinely good, as opposed to the other “celeb” kibble out there (Noutrish) that is a low-quality product designed to make the highest profit margin. Because the Dog Whisperer kibble has a much wider distribution than C&P ordinarily ever gets, owners can get a decent kibble at a store that is not generally known for high-end stuff. His supplements are gentle and at worst harmless and at best may help some dogs out. I can’t figure out who makes the shampoos but there’s nothing in there that I worry about. So as far as I’m concerned he can plaster his face across any high-quality product he wants – it helps the dogs whose owners buy based on that name recognition. I don’t get too worked up about methods, honestly. In my experience MOST “miracle” trainers, using any methodology, are those people who have a presence that dogs very easily translate into acceptable/unacceptable signals. The trainer will swear up and down that it’s the method, but the dog relaxed and started paying attention the minute the trainer walked into the room, long before he or she removed the clicker/target/prong collar/choke/what have you from his or her pocket. They could probably get identical results using a banana and a washing machine as their training devices. Owners have to find the method that THEY can implement most consistently and instinctively and clearly, without harm. If the dog is eager and happy, there’s mirroring between the dog and the handler, signals are clearly being given and received with minimal static, I don’t care what’s in the handler’s hand. Glad to hear your critique of Cesar Milan. I think it’s quite fair. Maybe not the place for this, but, speaking of the heat: Any ideas for helping to keep cats cool in this weather? I’ve got no air conditioning, and my kitty refuses to lay in front of a fan (would it help much anyway, since she can’t sweat?). Tried giving her an ice cube to play with, but my usually bold cat treated it like it was a freaky thing from another planet and won’t go near it. terry wrote: “as for Merial – the mind boggles. a company that supposedly represents *Science* and *Research* and *tested outcomes*, naming a 9th grade graduate whose primary source on dog behavior and learning was his grand-sire in a rural Mexican state, over 40-yrs ago, as their CORPORATE face of dog training for the 21st century? Thomas Alva Edison, Wilbur and Orville Wright didn’t graduate from high school either. However, having a formal education doesn’t make a person any less qualified than a real-life expert like Cesar, who got HIS education from the dogs he works with. It is marketed though, as family friendly and balanced, as if it were safe and psychologically good for a dog’s well being. Dang, I just sat down to read a little for relaxation and now I have to go post a quick blog entry to refer my readers to this absolutely outstanding article and thread! It put into words what I couldn’t. I appreciate the fact that now people are exercising their dogs. But the methods used in the actual “training” are scary, and not safe for the dogs, or the people. Thank you for putting into words some of the concerns I have had with Cesar and his techniques since I first saw them! I see people who truly believe by doing exactly as he does on the show they should be able to have his success. These people have no idea what goes on that ISN’T shown in a 30 or 60 minute show, not to mention the issue of “presence” that I’ve never been able to describe, than you for putting a word to it! As for Merial – shame on them! I don’t particularly like drug companies aligning themselves with anyone of celebrity status, and can appreciate the controversy here if this were to happen. At the same time, I do not think that Cesar Millan’s concepts are that far off-base or (in most cases) extreme. Cesar, himself, states over and over and over again how important the presence of the person is who is handling the dog; how the handler must have a strong energy and project that they are stable/in control of themselves and their situation. I appreciate the fact that Cesar tries to establish that these are animals as opposed to little people in fur coats and, as such, need to be treated as such. In that, I mean that the way they think is different than the human though process, and should be handled as such. First, I would love to hear Trisha and Cesar together. Wow. Hope that happens sometime. In a nutshell, I would love for myself and my dogs to meet Cesar, BUT do I want him ‘rehabilitating’ any of my dogs or ‘training’ me? No, no thank you. I think he has a romantic, American-dream type story, and that his personality is mostly to credit for his success. In some ways, I am very happy for him and the dogs that he’s helped (how many dogs truly helped is controversial, I agree). However I am saddened for the many people who have campaigned to stop any training methods even potentially harmful to animals. What a hard but noble battle! I still feel bad about any of the times I’ve been too harsh, either physically or emotionally, with animals. It is so much more pleasant and fun, fun, fun to use positive methods. I can’t describe how much joy it brings to my life. In other words, not a terrible guy by any means, but I don’t support his methods or all of his persona. I am happy to be a savvy consumer and say, okay Merial, there are other products I can buy instead. We just have to know what’s going on with the companies we support. Since this is already a controversial discussion, I might as well give an example provided by the most recent issue of Sierra (Sierra Club publication): AT&T was a two-time maximum donor to the Bush-Cheney campaign. I say yikes! I was relieved that I’ve never used them, but was reminded to look into where my money is going as often as possible. Political differences, like other ideologies, run deep, and if we all can’t get out there campaigning for our side then we can still show our support in our day to day lives. I cannot wait for the humidity to go away, for everyone’s health and my sanity. Please Canada, share your cool, dry air with Wisconsin! Do you recall that Cartman attempted to kill his mother after the Canine Terrorist had “trained” her to discipline Cartman? I have to chuckle at the “oppositional” article posted. Every example was backed up by fear-mongering examples relative to child abuse. Dogs are not children. Dogs are not even human. This popular fallacy among dog owners is the reason many dogs have issues to begin with – speaking of behavioral only. Because of dogs’ unique genetic programming for pack life, pack positioning, and a desire to please, a huge swath of behavioral – and yes, some chemical – issues can be relieved or reprogrammed through consistent behavior. It happens to work on these creatures. But to train a dog is to understand a dog. To understand a dog is to leave your human overlay behind – something which many commenters seem unable to separate from. Nothing Cesar does is cruel. Dogs are very physically hardy creatures who communicate through what humans would consider “cruel” messages. They bite each other, bark, snap, wrestle, dominate. That is their language, even in play and love. It’s like being angry at the Asian population for having a snappish machine-gun monotone in delivery. Like they’re shouting or constantly annoyed. They’re not — It’s their language, beautiful and natural to them, perhaps undesirable to others. Finally, the last comment about Cesar’s “charisma” — the energy you project is a silent language dogs can speak. Thoughts are energy. Thoughts exude energy, measurable energy. True, not everyone has the ability to adopt that calm assertive leadership through their own trauma or personality preference – then those people should not own dogs, because it is the language of dogs and dog heirachy. Not everyone is cut out to be an effective business owner, or doctor, or lawyer. Same for dog owners. To be a steward of a domesticated, dependent animal is to agree to fulfill them. Not yourself. To have a happy and balanced pet you have to understand and accept what they need to be happy and balanced. Get a cat if you want an animal who likes to be petted and doted on. Dogs are social, dogs are born to be followers – look at any litter with their mother, obedience is the first thing they learn. What a shame Merial seems to have chosen their spokesman “American Idol” style – the most popular, rather than true knowledge. A dog person I respect says she believes he has a knack for understanding dog communication, and for communicating with them, most likely by non-verbal body language, that he isn’t even aware he is doing it, and thus cannot help Joe DogOwner to communicate as he does, so he is actually less helpful to those who don’t know what to do than other trainers. I too hope merial will rethink their marketing plan.I actually have never seen an episode of the” dog whisperer”as I am too cheap to subscibe to more than a basic cable service.I did buy his first book two and a half years ago when I adopted a husky lab mix with significant behavioral issues and found that trying to apply his methods made things much worse rather than better.For me and my dog positive methods have sl;owly but progressively led to improvement and as a scientist I appreciate the evidence behind the methods.Here in Montreal CM has unfortunenately made an apperance as “Cesar parle aux chiens”.The result is seeing people alpha rolling their dog in the dog park for growling or having a disagreement with other dogs.I cringe inside everytime I see such a thing and my observation at least in dogs I see regularly is that such “training “leads to a real problem of aggression.People in general have lots of misconceptions about the true nature of dogs and eagerly buy into the concept of dominance which honestly is much m ore applicable to us than to our dogs.We also as humans are often looking for a quick or magical fix for our problems and these tv shows seem to be designed to fulfill this fantasy.Its not limited to shows about dog training but can also be seen in other reality show formats such as weight loss shows and shows where experts help people get their finances in order.What you rarely if ever see is a follow up visit one or two years later to see what the ,long term lasting effect of these interventions really was. While I may not agree, or even understand many of Cesar Milan’s theories and techniques, I am very grateful to him for a couple of ideas that he has promoted. The first is that dogs need training and consistency in order to be the good companions we all want them to be. The second is that dogs that have been stigmatized as “aggressive breeds”: Pits, Rotties, (my beloved) Shepherds, etc are DOGS, not breeds, not stereotypes, they are dogs, needing all the same things all dogs need. And most importantly he has dispelled the mystique of these adoptable dogs, who languished in shelters and rescues, after being evaluated by competent people, only because of rumored reputations. We are seeing more and more dogs of these breeds being adopted by normal families who want a good companion animal. A lot of these people have seen Cesar’s “Daddy” as a wonderful ambassador for Pitbulls. I think before real change can happen in society, it has to be presented in a way that people can respond to—Cesar Milan has that charisma of the common man. He has helped people understand that dogs can be integral parts of one’s family, rather than a “pet.” So, I think Merial is shrewd to nab him as a spokesperson. People who love dogs, good, well-meaning people, not dog experts, see him as an authority, and I guess if listening to Cesar, and taking his word for it, prevents one case of heartworm or Lyme disease, then it is worth it. That being said, I have watched his shows, read his books, and just could not apply what he espouses. I guess projecting positive energy is a little too new age for me. I learned positive reinforcement training techniques in rescue, and that is what has worked for my own dog and me. I think Temple Grandin made a point in her book “Animals Make Us Human” that Cesar bases his techniques on dogs who live in forced pack, or unnatural living situations. Their reactions, and the importance of dominance is very different than in our own backyards with one or two dogs. Even wolves don’t live in packs of 50, and they are mostly family groupings, not a rag-tag bunch, of different shapes and sizes, thrust together in a junkyard dog situation. That in and of itself, must work on a dog’s psyche, and not in a good way. But different schools of thought come into and out of fashion. I think the key to having a happy guardian as well as a happy dog , is to take a little of all the collective wisdom, and use what works for you. I know what works for me and Gracie, and I recommend “The Other End of the Leash” to everyone who has a dog in their life. Finally — an honest and fair evaluation of Mr. Millan’s apparent techniques without the vitriol that often accompanies those who disagree with him. I do not completely agree with his dominance or leadership philosophies, but I also enjoy watching his show. I would venture to say that he is often successful and is not afraid to take on cases most trainers avoid. And I also agree that many dog-owners take on what they THINK he is doing without any real understanding and end up worse than they were before. Mr Millan has a TV show — one that is edited for entertainment. If you do get a chance to chat with him — I hope we get a full report! THAT would be fascinating! Please be careful with the “Dogs are very physically hardy creatures…” thought. Yes, it’s true, some of them are sturdy, but that doesn’t mean they can’t feel pain. It’s easy that some people could use that to justify animal cruelty. And, excuse me, but how can you measure the “energy” of your thoughts? Are you talking about the activity an EEG shows? Or it’s a mystic thing? As a professional dog trainer who uses the science, not energy, to teach dogs (and their people), I can’t thank you enough for posting on this topic. I am disappointed that Merial has decided to pair with a person who uses techniques not supported by science. I have stopped using Merial’s products and will educate my clients and veterinarians, as well. I am not a dog trainer or vet. Merial should be ashamed of itself. It’s obviously a profit motive. I do watch the Dog Whisperer, and I find myself fascinated by it. I also kind of wince sometimes, both from some of the things he says to the people and some of the things he does to the dogs. Yesterday there were two wolf hybrids. There was a disclaimer that the Humane Society does not recommend keeping wolf hybrids or wolves. But Cesar said nothing. I thought they continued to be somewhat unmanageable. The people were very patient. The dogs were far from “rehabilitated”. He took them to his “Dog Psychology Center” and one wolf was totally unable to ever relate (well its a different species!) Perhaps the other had more dog blood. There are many programs with elements of dog behavior and positive training. “It’s Me or the Dog” (Victoria Stillwell), sort of a Super Nanny for dogs, and maybe the same producer); “Best Friends” (dog rescue); “Underdog to Wonderdog”. None of these are anywhere near as popular. My guess is it is Cesar. Malcolm Gladwell also says he moves like a dancer (turn off the sound, it is true). Alth0ugh Victoria Stillwell uses some contrived techniques, but no where does it say that you shouldn’t try them at home. I think all the bites and viciousness you see also are a draw to Cesar (though not to me)–wow, this is so dangerous. So it appeals to the macho element. I think he has two good points– dogs are not little humans (esp with the toy dogs) and dogs need exercise. But I don’t agree what is and isn’t exercise. I would argue that if my dog plays with dogs she gets more exercise than walking with me. But she does pretty good mountain climbing with me, but that isn’t a simple walk around the neighborhood. While I do not necessarily like what Cesar does, there are a few things that I would like to say in Merial and his defense. Great piece, Patricia. I hope you get the podcast going. I am not a follower of Milan’s methods, at all. I have watched the show a couple times and didn’t see anything I wanted to try, especially his confronting a couple of fear aggressive dogs in their back yard. But I do think there is an important aspect of the “energy” thing he talks about. It is not mystical, it is another way of saying the confidence and attitude you project through your body language. We humans see it, and dogs see it magnified x 10. I train stock dogs, and this is a huge factor in whether a handler is going to be successful. If they are projecting a wishy washy attitude they will get nowhere with a strong and intense dog, who only and passionately sees sheep. The first thing to learn is how to step up and confidently take control. It is interesting because I checked on the Frontline (http://frontline.us.merial.com/) website and the Heartgard (http://heartgard.us.merial.com/home/) websites, and they make absolutely no mention of this promotion. The only promotion you find is a $5 coupon for Heartgard and a buy 6 get 1 free on Frontline. There is also no press release on the Merial website announcing the partnership. In fact the only mention of this is in the blogosphere of websites opposed to Mr. Millan. You can’t even find mention of the promotion on his website and it is pretty plastered with anything and everything you could advertise for dogs. First, I would like to actually see a press release from Merial or the actual promotion before I pass judgement on Merial. Second, I think it is grossly irresponsible to “boycott” medicines like Heartgard and Frontline which have much higher efficacy than their competitors products. That is like cutting your dog’s nose off to spite its face. Do I really want to risk Heartworms, Lyme disease or Sarcoptic Mange because I may not agree with the methods of a person associated with a promotion. Isn’t the health and well-being of my Pet Dog my primary concern? Third, even though I can’t find any official mention of the promotion, it sounds like it would still be up to the individual veterinary clinic to actually hand the DVDs out to the patient’s owner. While Merial may be making the DVD available for distribution, it is up to the vet in the end to distribute. Why not just try to influence the vet’s, who are supposed to be guided by the principals of science to not promote Cesar’s way? Fourth, where is the uproar around the unscientific and outdated advice handed out by veterinarians about dog nutrition? Where are the cries of conflict of interest when a clinic stocks and sells Hill’s products as an answer to your animal’s ills. Hills main ingredients are Corn and Rice. Their protiens are low quality byproducts and yet our vets advise us that these diets are in the best interest of our carnivore pet dogs. Really? I had a vet advise me against feeding my dog from Kong’s, stating “The lion in the jungle doesn’t eat this way.” and then turns around and sells me Prescription Diet I/D because my dog has an upset stomach. Does the hyena on the Serengetti eat corn and rice??? Since when is being right more important than the health and well-being of the dog. If you really want to “beat” Cesar, then the Positive Training community needs to come up with an allstar answer as charismatic and marketing savvy as Mr. Millan to get the message out there. Is there anyone within APDT that has that kind of star power and reach? Ian Dunbar? Maybe, but he tends to get a little too preachy. I think the best answer to quite the cult of Cesar is to beat him at his own game, not whine like petulant and jealous little children. It just sounds like sour grapes. The presence he has is called ‘phrasing’ and it’s his ability to move with intention. People gravitate toward him because of it and dogs also respond because he’s good at communicating his intentions through movement. This has nothing to do with his training techniques which of course I agree are not beneficial or serve the dogs. An excellent article about Ceasr and “phrasing’ appeared a few years back – perhaps in the New Yorker? Actually no it is not. With the advent of modern genetics and DNA analysis, Dogs have been reclassified as Canis Lupus, the same as Wolves. Dr. McConnell even mentions this in her book. Dogs are further classified as a sub-species of Canis Lupus, Canis Lupus Familiaris. Alessandro: Where did you find info on the the efficacy of Merial products vs. competitors? I have only read that if administered in proper dosage, and on schedule, then other products out there are just as effective as Merial’s. Any info is sincerely appreciated. In Allesandro Rosa’s last post she mentions several other areas to be concerned about regarding advice we receive from our vets. Personally, I would react the same way if my veterinarian broadly promoted any procedure, treatment or product that all five of the major scientific and veterinary industry organizations had determined to be cruel or inhumane. While I do my best to feed my dog a grain free diet, so far I don’t believe corn has been determined to be either cruel or inhumane by anyone with the credentials to say so (aside from giving it to dogs with corn allergies of course). I’ve never been able to get good results using Millan-style methods. I just haven’t. Now, when I’ve used the more positive reinforcement-based ones, I get results, and my dogs are well-behaved. Some people might be able to train the way that Cesar does. I’m not one of them. In fact, a lot of what he does seems a bit dangerous. He does get bitten a lot. And in the wrong hands, I worry that these methods might create some really nasty fear biters. I don’t have “presence” or “energy,” but I do have toys to retrieve, my touch, and food rewards. And that gets me results. I’ve never seen a dog do an “alpha roll-over.” Never. So why should I do it? In your post you corrected my statement about dogs not being wolves as a species. I have read about that– that they are. I think I meant it a bit more colloquely. We don’t think of dogs acting like wolves. And wolf hybrids* do seem a lot more reactive, etc. than dogs. In my post, I just meant I was concerned about people watching this and thinking that it was a good idea to go out and get a wolf hybrid. There are about a zillion sites on the internet, I just checked. I read on Cesar’s website that he is wanting to work with more wolf hybrids. I think that there are many people would not agree that this is a good idea. It is like Obama getting a Portugese Water spaniel, now everyone wants one. *technically there is a probably no reason to really call them wolf hybrids! I made a point clearly that I do not agree with methods used on the show, and wonder whether or not National Geographic did their homework on this one, does it meet their standards? it seems the information is well documented at the professional organizations many have referred to above, are Veternarians aware of the disconnect, when did this proposed agreement take place? I’ve been reading your comments with great interest. Thanks for taking the time to write. For those of you who are wondering if this program is really off the ground, the answer is yes. I didn’t find it on their website either, but the DVDs are playing in vet offices around the country right now. I have a pdf that is the promo sent to vets from Merial, and it says that clients will get a “FREE Dog Behavior Video with segments from CM’s amazing Mastering Leadership DVD series plus other bonus content.” Clinics who participate also receive free downloads of the same video that they can play in their clinics. This program is active in some parts of the country and not others, depending on several factors, including local representatives of Merial. My own vet was contacted and called me up right away, concerned about the connection. And to Joanna, who said she didn’t get “too worked up about methods.” That’s an interesting point–my yoga instructor said “You know, people are always focused on the method, but 80% of success is dependent upon the practitioner.” I find that an interesting point BUT I agree with Luescher’s concerns (thank you Jennifer) that positive punishment and flooding can have serious consequences. I too have seen episodes of DW in which dogs appeared to be stressed and frightened, and could never be classified as “cured.” Suppressing a problem behavior with force may make the dog easier to handle in some circumstances, but can make it worse in others. At best, the dog is still frightened and suffering. Perhaps the most important criticism I’ve heard in these comments is that his show is full of warnings to not “try this at home.” But, as has been pointed out, of course people will try it at home. Why wouldn’t they? Isn’t the point of Cesar’s work to educate people about dog training and behavior? I’m very glad you informed your readers on the upcoming joint project, but to be honest I am not that surprised. I went to a chain pet supply store a few weeks ago with a friend and noticed he also sells water now.. I knew it wouldn’t be long before he gave in to the idea of a large sponsorship of some sort. It is also interesting to note, as mentioned in a previous comment, this is used as an “intoduction” or a sample from a new video series he will be releasing soon. Just so everyone is clear, this does happy very frequently in a hospital setting as well. Before turning to a life in a lab, I worked in a hospital setting and you’d be shocked to know several of the places I worked in residency allowed drugs reps to provide lunch 3-5 days of the week with a once a month cycle resulting in only 1 meal or so a week having to be purchased by the staff. Do you really think they would continue to do this if the doctors weren’t providing some sort of positive feedback? I found this action appalling, but still ate the food. I believe I have the same opinion as our blog hostess, some aspects of what he does is great, while in other situations I believe is over-reaching or misrepresenting his background. I also do not like the use of the word “dominate” either. It seems like anytime someone’s dog doesn’t do as they ask the first time, they believe their dog is being dominate or they have to assert themselves as “alpha.” These terms are so overused it’s frightening and as a rescue volunteer, I find it very tiring and have since gave up on correcting each and every person who misunderstands what their dog is trying to tell them (not that I know definitively either, but sometimes it’s obvious they’ve been watching to much TV and haven’t read much real literature on the subject). As far as the dogs vs wolves comment something can be related to another similar species and not BE the same species. I think you make several valid points but the use of the word “ARE” in an A equals B relationship is a bit strong for my scientific self. I guess it’s an occupational hazard on my part 🙂 To prevent the post from further derailing from the original topic, I’ll leave it at that. I based my statement of efficacy on published research studies that I read on the Frontline and Heartgard websites which showed comparisons to products produced by their competitors. Since I saw those, the Frontline website seems to have been redesigned and there is no longer a link to the research study. I have no idea if this means that the FDA issued a warning letter to Merial to pull the link or whether Merial decided the information was too technical for a consumer site, but it is no longer there as far as I can see. From what I remember of the study for Frontline Plus, it responded faster, killed fleas and ticks sooner and continued protecting after the 30 period, where other products started to loose effectiveness at 28 days. You can still see reverences to this on other websites if you do a search of Frontline Plus versus, but they do not link to the actual study that I could see. The Heartgard website does still show that Heartgard Plus’ use of Pyrantel along with Ivermectin provided the additional benefit of deworming for Roundworms and Hookworms which its other leading competitors couldn’t claim. The FDA website does have the approval letters posted, but I do not know if this will give you the comparative data you are looking for. Is it possible that one of the Vets that read this blog may be able to provide a link to the studies I saw on the Frontline Website? My point was pertaining more to conflict of interest as opposed to being cruel and inhumane treatement. I feel it is a conflict of interest for a veterinarian to sell Prescription Diets which the latest nutritional research would consider substandard. I think that the issue of a promotion between Merial and Cesar Millan is one of a conflict of interest and not the promotion of cruel and inhumane practices. While his methods may be questionable, his message that it is far better to try to save the dog and not give up on it should be applauded. Even with positive training, the first thing that any trainer or behaviorist needs to know is “What are your expectations for the dog?” Are you cool with the dog lounging on the couch or are they religated to one doggy bed in the corner of the back bedroom? The other thing that I see from the Positive Training literature is “How can you expect the dog to know the rules if you haven’t taught them your rules?” The spirit of Cesar’s message is just that, you are the human, it is your domain and the dog is a guest. You are responsible for them and providing them with the information they need to be successful members of your home. Without that clarity, you only have yourself to blame. His approach may be a bit of a throwback to a spare the rod and spoil the child approach of dog training, but is it as bad as the stim collar crowd, the beat the dog crowd or the euthanize the dog crowd? It may not be ideal, but it at least advocates trying before you throw the baby out with the bath water. I see everyday with the packs of street dogs here in Greece, the behavour described by Cesar .There is nothing ‘humane’ about stray dogs relationships but they develop a respect and dependence with each other and the balance seems to work until the next event! I rescued a terrier here and CM’s calm disciplined techniques have solved many issues my lovely dog had..I also use clicker, positive reinforcement and Ive never had to punish him or cause him any distress. We all have to use common sense if we are choosing to have a dog in our lives..its a wonderful learning experience and its so good to share our experiences…and of course keep an open mind! I am sincerely worried that one day Cesar Millan will arrive to Italy… His book has been recently translated and i suppose it won’t take long before he crosses the Ocean. In Italy we are really really far from training dogs in a respectful way and I am afraid this won’t help!! Well… we’ll see what happens. went through the comments, and wud lik to tell ppl who say cm’s technique is wrong that stop comparing dogs to humans. humans are treated as humans should be whereas dogs to b treated as dogs and not humans. applying technique over a dog can’t be used over human, and why should it be.. so does cm. he knows how to handle dogs and he has proofs to show. the techniques he uses aren’t humanised but the ones meant for dogs. i hope i conveyed something important. While his techniques may work, and there is some contention that there is a lot of smoke and mirrors at work with his TV show, there are other techniques that work, such as lure/reward and reward marker based training which are very successful and are both enjoyable and non-threatening to the dog and the trainer. I have never seen one of his shows where he himself uses object based play to train a dog, although there was one, I believe with a German Shepherd Dog, where the trainer, not Cesar, used toys to get the dog to respond. The question to you is, if there are two ways to get a dog to perform a request and one is coercive and the other allows for free will of the dog to make the right choice, isn’t it better to choose the later? Or is it that you need to dominate a dog in order to feel good about yourself and superior to another living being? Do you use coersion with a server at a restaurant when placing an order? If you do, then you better expect not to be getting “clean” food a la Fight Club. You may get a quicker response with coersion, so as to make the unpleasantness stop, but it will not necessarily be a response that becomes engrained without a lifetime of coersion. And like with the Fight Club example, you may get results which are less than desirable. What is more reliable, an entity which performs a task out of the fear of reprisal or an entity which performs the same task out of a love of doing that task and a respect and/or love for the requestor? While I have spent much of my responses to this post pleading for the benefit of the doubt for Merial, especially when others questioned the science behind their products, and defending the spirit of what Cesar does, which is to compel people to see that it is well worth the effort and work to instruct and save the noble animal that needs their guidance and help, I would not follow the letter of his techniques at all. Cesar advocates effort and hard work and I am all for that. I have seen people in my neighborhood use easywalk harnesses and Halties on puppies of less than six months old!!! Are they lost causes at such a tender age? Do you really need these devices to control the dog, are they incorrigable cases, or do these owners just need to spend a little more time and a lot more treats on the practice of leash skills? I think it shows why people are so enamored with Cesar. They want instant results, which is what it appears to be in a highly produced, 10 minute or less segment. But true learning and collaboration is a life long endeavor that requires a committed partnership between trainer and dog and not even Cesar says that there is an easy way out, just that there can be fast results that have to be followed up consistantly. I worked at a Humane Society for 4 years. He did visit our shelter (his organization wanted to donate money to shelters- I suppose so they could say they donate to homeless animals) and my opinion did not really improve upon meeting him… or not meeting him. He only talked to the director, program operators, and board members. When he was brought through for a tour of the shelter, passing the majority of the employees who gathered at the front office to see him, he did not look at us or speak to us. He looked as though he was trying not to acknowledge that we where there. I must point out that his wife was with him and did make an effort to communicate. She was very pleasant, introducing herself and complimenting us on the shelter. Cesar was not being rushed through he just chose not to engage with us or look at us. I thought it was very odd. He did take the time to turn up the charm for the crowd of people that had gathered outside to meet him and get his autograph after his tour. His entire demeanor changed, like turning on a switch. I wonder if he has a phobia interacting with professionals who deal with animal behavior on a daily basis? I would have liked to have known what he thought of our training techniques (we strictly used positive re-enforcement as well as head/body harnesses & flat collars on our animals- I know from his book he does not like gentle leaders)… we refused to implement his training techniques as a prerequisite to his donation. The Director told us that Cesar did not say very much, so I don’t know what his thought process was on the visit or his interest in being there. I love that your blog encourages thoughtful debate on all behavior subjects and have enjoyed reading some of the responses here. I thought this link was very interesting. I’ve met Cesar and he does have a “presence”. He seems like a genuinely nice guy and my dog loved him and warmed up to him right away. People flocked to him and stood in line for hours to get a picture with him and he sat patiently until all the people who wanted photos got them. He had a real smile on his face all day. He did an event here in Seattle for a local dog rescue whom I volunteer with/train for and when it was finally time for me and my foster dog to go meet him we were turned away by security saying no dogs allowed. What they should have said was no pit bulls allowed. Cesar’s manager bypassed security and personally escorted us to the front of the line for our photo. His entire entourage was friendly and seemed genuine. I’m not a fan of his by any means (I’m a member of the APDT and stay up to date on current positive training) but after meeting him, I understand the “presence”. P.S. @Annie-“All things are good things that don’t hurt the dog”? Cesar is hurting dogs…. Claire, that’s an interesting story about your shelter. In Malcolm Gladwell’s article, he seemed to imply that CM did not have great people skills and really preferred dogs from an early age (heck I can relate to that!). He does appear to have a certain charm and presence (again whatever that may be). Perhaps he felt insulted that his techniques were not being followed, since he was giving the money. Who knows? Also a great article. I think alpha rolls have been pretty well reputiated. l like the idea of not reinforcing “pushy” behavior. But I am not so sure it is always “pushy”. For instance, if a dog goes out of the door before you do, I just think the dog wants to go outside really a lot. To define it as “pushy” anthropomorphizes it– if a human did it it might be pushy perhaps. But I like the concept anyway, without trying to define it. As a Dog Warden, I’m regularly in homes dealing with problem dogs. On bite calls and other nuisance calls, I often get asked about Cesar’s methods. There is a clear and undeniable relationship between watching the TV show and having a poor relationship with your dog! I can tell you firsthand that people who don’t know better ARE indeed putting Cesar’s techniques into use and ARE indeed harming their animals leading to unfortunate, preventable bites. I agree that some of his techniques are acceptable..i.e. work hard, exercise more, and so on. But, Cesar can not lay claim to “do no harm”. If I responded to a call about animal cruelty and firsthand observed what I’ve seen on TV, specifically choking an animal to near unconsciousness and chasing a dog with lawn candles and sticks, then I would press charges for a violation of the state’s cruelty codes. Personally, its not sour grapes, its a knee jerk reaction to the troubles I have to deal with on the job because of the awful things Cesar portrays to the public. Trisha, thank you so much for all the wonderful books you’ve published that are easy to purchase and easy to read and implement. It saves me hours and hours of trying to communicate things to dog owners. I recommend your books and I’ve seen them go a long way towards solving problems. I laugh when people do silly things trying to train their dog (like peeing over top of their male dog’s pee), but I can’t laugh at Cesar’s methods. Always remember the maxim, “do no harm” when offering training advice. Dogs are ending up in shelters because Mr. Millan’s methods do much to harm the human animal bond rather than help it. I can agree to disagree with trainers when I simply prefer one technique over another, but I can’t agree to disagree when I see dogs harmed and relationships broken because of techniques. I’ve held off for a bit, but I finally had to jump up on my soapbox. I’m conflicted. Cesar’s clear book with its emphasis on exercise, discipline, affection was one of my mainstays when I adopted an 11 week old lab/border collie mix at 61 – my first dog since leaving home at age 18. For my actual dog training I read and followed Patricia McConnell’s books because I could replicate their techniques. I now have a great adult dog who behaves herself and is still great fun. But Cesar’s book was good too, and very clear about the human obligation to an animal – it is NOT a training book, but an explanation of his theory of what dogs need to be successful. The problem is with the TV show. Much of it is great, but specific techniques he uses can only be done correctly by people with his skills of both observation and timing. Ordinary mortals just mess up their dogs or get themselves bitten. My neighbor lost a finger part to an angry miniature pinscher he was trying as Cesar Millan move on. He sheepishly acknowledged he knew the show said not to do that and never to try any discipline when he himself was angry – but he did it anyway because he’s seen it work on TV. By the way, someone on his team really does understand merchandizing. His dog toys, like the Squirrel Shell Game toy and his line of crates are really pretty good. Lucy, there is a neat little disclaimer before the show both audio and visual. However, I think most people see this program as educational and not as entertainment. So why wouldn’t you try these techniques? Truth is there are times Cesar gets bit doing some of the things he recommends. I don’t know about the books and CDs. Right now I am reading Karen Pryor’s new book– that’s what I’ll be recommending! Great stuff. Re: “presence” — I think you do yourself a disservice, Trisha. I’d match your presence with Cesar’s any day! Each time I hear you speak (in person or on the radio) or read your books and articles, I’m struck by your sincere compassion for both pet and owner, and your deep knowledge of, and curiosity about, animal behavior. The seminar you’ll be presenting here in Seattle in Sept 2010, though more than a year away, is filling up fast. So people “just want to stand next to” you too. Wouldn’t life have been so much easier if the fine folks in charge of programming on National Geographic had consulted with true dog training and behavior professionals when picking a new “star” for their program? Perhaps, in that case, people would have learned from a proper trainer or behaviorist that dogs need physical activity, a calm environment, love and leadership, in addition to some modern, correct and humaine training methods. The only aspects that everybody agrees on as being positive in CM’s advice are those that any decent professional would have promoted. A show starring a true professional canine behaviorist at work would have been so much more fascinating to watch and thought-provoking. CM’s shows (at least the ones I have watched) manage to be mostly upsetting and occasionally down-right funny (think giving a tennis racket to the owners of a dog that was lunging and barking at visitors; yeah, they needed an expert to tell them to push the dog back with that specialized tool! )Air time would have been put to so much better use! I can’t believe people are so upset with Cesar MIlan. He is a really decent man only trying to help people understand their pet. That’s why he’s called “The Dog Whiperer”. It’s not something you go to schoold to do. It comes naturally by observing dogs in the wild. You either have it or you don’t. His goal is to teach people to understand dogs so they don’t get frustrated. I have no problems understanding his philosopies. AND it makes sense, and the dog listens and is a lot easier to handle. I also own a horse and use “The Horse Whisperer” techniques with him. And I recently aquired a kitten and I’m teaching her as well. I found out about Patricia McConnell because Cesar lists her book “The Other End of The Leash” as a resource in his book “Cesar’s Way”. I do agree with his methods because he’s applied it rightly in the right situations and he’s even promoted positive reinforcement in his later shows. It has helped us greatly with our dog, in addition with our trainer, Patricia’s and other books, and shows. In fact, Because of Cesar’s show I’ve been opened up to a whole new world of resources outside of his as well. It’s their company. They’re trying to get their product out there just like everyone else. Like Jeri, I found out about Patricia McConnell through Cesar’s books. That was very well said Sheri. Ceasar is all about rehabilating dogs. I know nothing about Patricia, I’m sure she is doing good stuff too. Just different methods. Cesar is not a trainer, he rehabilates dogs and helps people learn how to get a well balanced dog. His methods work and even though they’re not scientific they follow the way of the dog. He also tells them to seek help from a professional if they can’t do it themselves. I’ve never heard him putting down trainers. I am not a professional dog trainer, but I do find that I like Cesar’s ways and I will continue to support him and the things he is doing to help rehabilitate dogs. I’m on the side of anyone who wrote that they are upset that other people are attacking Cesar Milan. I watch his shows, and he’s not hurting ANY of the dogs. All he does on his show is to show people how to snap the dog out of that state of mind, that is doing that unwanted/unacceptable behavior by just touching the dog. You have to look at it as common sense. The person who wrote something like, “it’s your home, and the dog is a guest” is right on. You can’t allow the dog to take over your space. I don’t think Cesar’s methods are bad at all. He’s just basically saying that you have to be calm and assertive when you’re telling you dog to stop doing the unwanted behavior. When there are certain scenes where a dog does get aggressive, -still, he’s not hurting them at all- I think. He holds them and tries to get them to relax into that calm state of mind. And another thing I think is totally wack, is that, -do you think the Nat Geo channel would even air a show with someone who is purposely hurting animals??? Really! That just doesn’t make sense. Cesar is a dog lover and a lot of people respect what he does. I think the cooking show analogy is correct – people watch Martha Stewart and don’t think they can really really make their own five-layer wedding cake (and there are no “don’t try this at home” message on that show) yet they watch a show about dealing with dogs who have serious problems – sometimes dogs that other family members or the law want dead – and think both that their own dog needs that much help and that they can manage it. What’s the theory about the less people know about something, they more likely they are to think they are competent? And of course the show has created, or helped nurture, the romance of rescuing or rehabilitating a dog. There are just hoards of people out there who will go on and on about how they cured a tragically messed up dog using nothing but beef hearts and the music of Yanni – when what they have is a perfectly nice dog that’s a little nervous around them and just fine when they aren’t the focus of mommy’s overbearing attention. I hope that there’s a larger population of people who watched the show and realized that they have some responsibilities, got off the couch, and took their dog for a walk. As on comment noted, he does train dogs that others won’t. I am getting more than a little tired of trainers and veterinary behaviorists whose websites and brochures are very pious about pure positive when half the dogs that show up at my balanced trainer’s class are referred by those same trainers and behaviorist because their step one, prozac and a head harness, wasn’t enough for a dog that was less than entirely biddable. It’s very shaming for those owners to spend a few weeks and more than a few hundred dollars being told there is only one right way to train a dog, and then to be sent away because their dog can’t be trained that way. And then they have to go and tell all their friends who recommended the trainer/behaviorist that, no, they aren’t going there any more and then deal with the assumption that they’re beating their dog with a brickbat or something. Can we have a training show called “Stop throwing food at the dog and start paying attention!” because that would be fun. Frankly, I just don’t think we’re going to see a TV show where people train normal dogs by doing the same thing over and over in short sessions. What’s the point of seeing a dog walk quietly on a loose leash with a flat collar? If I put up a YouTube video of my dogs sitting quietly in their places while I cook dinner, well, I don’t think many people would watch. How about a show where people sit down and write out their training plans? If there was a show about agility training, they’d show fast runs and mistakes and nothing else. 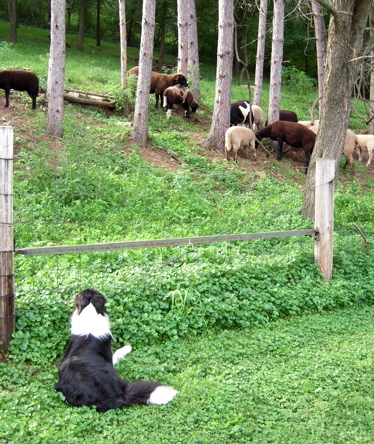 Have you ever owned and/or trained a Border Collie? Frankly, I’d be surprised at any BC owner making such a statement. Can you please provide a reference, beyond your opinion, to support this claim? I have two Border Collies (one a rescue, the other working bred) of my own, on of which I am training in stock work with, and would never, Ever make that claim. Border Collies, in my area, are in the largest percentile of owner surrenders because they are NOT easy animals to train. Are BC’s smart? Definitely. They are also high energy and have a specialized set of working skills, which makes them a particular challenge for the average pet owner and even trainers. So please, do not make such a broad, stereotypical and, dare I say Incorrect statement. And you also do yourself, and your dog, a disservice by choosing not to read Patricia’s books for that very inaccurate reason. With regards to the dogs/wolves discussion, a biologist by the name of Raymond Coppinger wrote an interesting and enlightening book called “Dogs – A New Understanding of Canine Origin, Behavior and Evolution” that puts forth some interesting theories and facts from a biological viewpoint. One of the underlying points being that dogs are to wolves as humans are to apes. I got here from EdgarSawtelle.com (that wonderful book) and have been just absorbed for a couple of hours reading, thinking, remembering etc. I am a trained behaviorist and psychologist and certified in behavior therapy from JosephWolpe. In graduate school I acquired a fear biting German Shepherd that was going to be shot. SoI applied all my learning theory to her. Ultimately I took her to Europe where she ate in restaurants and rode on trains, and saw the world with me. I am a great admirer of B. F. Skinner. His reinforcement schedules are a wonder. On punishment: punishment is effective as helpful to learning (rather than suppressing) in one instance. It must be applied just before the choice point. That is you don’t smack a child for running in the street (unless you are so distraught that you do) but rather you tap the child as you approach the curb. In other words, you remind the child (or the dog) to pay attention. I also worked with Edna Foa the originator and advocate of flooding. My shepherd Greta was terrified of thunderstorms. Here’s how you flood nicely: Tape cracking sounds, clap your hands, bang on a cymbal, whatever and record it for the length of the tape. Then when you and the dog are in a room you play the tape. Very very softly. You do this often and increase the sound each time until you are playing it very very loud. Afterwards thunderstorms will not be a problem. For awhile. There is such a thing as spontaneous recovery and the anxiety will return. You can play the tape intermittently as prevention or do it all over again if you see that the dog is again afraid of thunder. It’s just not a big deal. I have watched CM and compared to the people in my neon red town he is a positive wonder. Training a dog has still not penetrated their consciousness. But worse still for me is watching parents with their children. Teaching them to not be curious, not be intelligent or creative, and just generally crushing them that disturbs me much more. They will grow up doing unto others what was done unto them, and that will include their pets. No amount of talking to them will change that. But I think watching CM day after day on cable will amuse them enough to open their minds if only a little twist of the can opener from time to time. CM is macho enough to get their attention and he is good at projecting a certain charisma. So I think we have to start somewhere. He is not perfect, but he is a good start. You can follow up with No Bad Dogs (Barbara Woodhouse) with those of your acquaintances who are just beginning and like to be entertained while learning. Learning the language of your pet is the necessary condition. The same with your new baby. And each one is different. here is an interesting article about the “horned” one. Interesting how perspectives differ from differing viewpoints. Did you ever get a chance to sit down with Mr. Millan? I’d love to here that conversation. I’m new to this stuff, researching Cesar to decide what techniques to adopt or not. I wish I had more time to read all of the posts. There is obviously a lot of information given in the feedback. To get to the point, PLEASE, if you think there is a better method to rehabilitate an aggressive dog, video tape it and SHARE it with us. I’ve already read books saying pack leader mentality is crap. I watch Dog Town. I’ve worked with a certified trainer one on one. I have never seen an aggressive dog like mine rehabilitated EXCEPT on Dog Whisperer. If you argue they are only temporarily changed, SHOW me a dog who is going to fare better. As others have said, you don’t have to believe in dominance and pain to agree that dogs should have boundaries that do not include aggression towards people and dogs. There’s no point going on, it has already been said. My point again is don’t write about the better ways to do things. Anyone can write about techniques that don’t work on aggression. SHOW ME a territorial aggressive dog rehabilitated using soft methods. I hope you don’t fail and conclude it should be killed or live in a sanctuary, never in a family, until it dies. To Cory: I have read about many, many, many real dogs who where every bit as problematic as you describe and who have been rehabilitated using scientific, proven behavior modification techniques. Calling them “soft” techniques, talking about time outs and treats (what??? what program are you on to address this serious problem? ), and saying that you don’t know of any real such dogs who have been rehabilitated outside of Millan’s techniques makes me think that you have done only surface research into this and don’t really understand what is being discussed. I’m not saying that because I disagree with you. I really think you don’t understand the content of the issues and techniques. There’s nothing soft about it and it doesn’t sound like you have learned how to rehabilitate your dog. I don’t think I’m the best person to direct you to the information you want. But you might start by reading some *books* (not just web pages) such as the ones by Patricia and find on the web all the many, many success stories out there that involve true rehabilitation – not just supressing the warning signs given out by a growling dog as Millan’s techniques are likely to do. Of course, these turn-arounds didn’t happen in 10 minutes. I watch Cesar with fascination.Very few of the dogs we see on his show would be adoptable from most shelters.many are dangerous..They bite, they fight and bark enough to be a problem to the neighbors.I think many are on a one way trip to the vet. I am not sure why vet behaviorists are more qualified than Cesar in working with many of these problem animals?? ?.Vets do have medication available but are they as adept at meeting a dogs needs? ?Cesar has a pool and recently purchased a huge acreage for his dogs.He also has a group of potentially difficult breeds which seem to live in harmony.if those who criticize Cesar can do better then lets have a tv show? ?Sitting in an ivory tower does not impress me.Show me your rehabbeddogs.If we watch Silvia trkman we can also see a gifted trainer with absolutely no credentials Other than her results.Leave Cesar be!! I forgot to mention something. I suggested reading books/some real information, and I still think that is a good idea. That you are doing research at all is really great. But what about seeking professional help? If you skinned your knee, you would put on a bandaide yourself. If you seriously injured yourself, you would seek professional/expert help. The same should be true for dogs. If you need to teach your goof ball to sit, you probably could handle that yourself. If, on the other hand, if you have a dog who is “aggressive with dogs and people”, then surely it is time to seek out professional help – no matter how much reading you do? I read a TON before I even got my first dog (including one of Millan’s books). And I watched videos and read articles and talked to people. None of that equaled the great help I got when I actually took classes from experts who knew what they were doing. Of course, no matter how good the class was, nothing happened in 10 minutes… If it was shown on TV, then Duke’s progress would have looked like 10 minutes. In real life – not so much. And Duke is an “easy” case. JJ: Thank you for the links. They are similar to: dogwelfarecampaign.org. I will look more into Patricia’s work. I only said I’m new. I did not say I have never read books (Pryor and Donaldson), this was your assumption. I have worked for hours one on one with a certified professional dog trainer – a “positive” trainer. We frequently consult with trainers at the animal sanctuary where we adopted our dog. You did not read the part I mentioned this in the original post. The techniques were given to us, and they were not working, therefore, I continued my search. As I research more, it is clear there are many polar opposite views and few in the middle. I also did not suggest everyone should train exactly as Cesar does, but I will say that his techniques give people hope that the dog can be saved, and it has merit. You (and the articles) are correct that his techniques can cause harm if used incorrectly. Positive reinforcement is no different. Many owners worsen behavior (including aggression) by reinforcing the wrong things. This does not mean it should be abandoned completely any more than any other technique. You are also correct that 10 minutes is not the end of the story. My opinion is that most critics fail to acknowledge that the real change will occur once the aggression is suppressed and PR can be used to reinforce new behavior over the rest of the animal’s lifetime. The point is not simply to suppress behavior, it is to establish yourself as an authority figure who is capable of communicating (using proper body language) that aggression is not socially acceptable – the dog has never learned from dogs. Any good behavior is then consistently rewarded. This is commonly how human “animals” are taught (using verbal language) as well. I will agree if anyone says Cesar should focus more on this phase. He does, but it is often secondary. I maintain that if complete-anti-discomfort techniques worked equally well we would have examples to SEE. Reading will not express the subtlety of the techniques, especially with aggression. It doesn’t matter if the process takes a year, that is what edititng is for. It is worth noting that many owners cannot afford to wait a year with a risk of aggression in the house. It is also worth noting that many owners live in real world environments are not able to control the external influences as if it was a laboratory setting. I cannot go to public areas and avoid offleash dogs. Very controlled environments will get positive results using only PR, but that is not where most people live. I will also say that I feel teaching a dog what is socially acceptable AND conditioning a positive response using rewards is more holistic than rewards alone. Specific to your links: Expert critics can still be biased critics. I see the same in the human medical field. I am also less moved by Dr. Dunbar’s criticism after seeing his YouTube TED conference speech where a dog he worked with using his techniques is now dead. It is not enough information for firm conclusions, but it is clear he is not willing to show a dog that aggression is not acceptable in social groups. I contrast this with DW Seas 2 Ep 4 (streaming on Amazon). A very different outcome, and one that will be lasting if PR takes over. Also of interest (admittedly not a scientific review), there were no posts on vetmedicine.com article from dog owners using CM techniques saying it has backfired. Overwhelmingly the contrary. Well, after all the posts pro and con I have to say Cesar is still doing right by the specie dog. English would be his second language to those of you who think he should be talking more. In some circumstances if the speaker is tired no matter how much English they have learned it can drag a bit. This could appear as a bit standoffish. Even after living in the U.S. for 17 years. He’s a well known guy so lending his celebrity to products that benefit dogs is a good thing. Aunt Sue may deplore Cesar’s expertise but Grandma Gertie loves him. What are you going to do, its a garden party. I do have to think however, no one can keep secrets these days if Cesar’s fail rate was there somebody would be collecting a dime to sell the story. Not that people don’t try making things up. Its just so far none of them have stuck. So as it stands its opinions are us. I prefer Calm/Assertive with my dogs and that’s the way they roll:) Go DADDY! ones. I also pick up pointers from Patricia and have enjoyed her books. Cesar’s credentials consist of his track record. The guy has a pack of over 50 dogs that were once too aggressive to be healthy for anyone when in the hands of their previous owners, and these dogs are now all balanced and healthy. The negative comments published about him by groups exaggerate his use of so-called pain. He emphasizes repeatedly that he is not hurting the dog, but is briefly getting its attention. It is unfortunate that anyone would refer to this as “pain,” because it is clearly an intentional exaggeration designed to foment negativity towards Cesar without a legitimate basis for that fear. If his understanding of dog psychology is so flawed, how is it that he is able to calm any dog within minutes, maintain a pack of 50 previously aggressive dogs, and not be limbless after years of working with dogs? Just because a person’s methodology and philosophy differ from what you learned doesn’t mean the person is wrong any more than Copernicus was wrong for arguing that the Sun is the center of the solar system, rather than the Earth. Final note: use of prong collars and similar tools is not advocated by Cesar, but is simply not vilified by him. While I am not affiliated with him, I would venture to guess that he reacts with acceptance of such tools because to do otherwise would alienate dog owners, resulting in more people with uncontrollable dogs. I have used cesars methods on my own dogs and pack of 8 cats – his methods are quite simple, be calm and confident around your animals and they will be calm and confident in return. I wonder if all this cesar bashing is really the dog training community panicking that they will not be able to profit from all the junk they peddle. Haltis, whistles, clickers, harnesses, training leads, choke collars, extension leads etc etc. Are you not just peed off that Cesar has let the cat out of the bag? You dont need to buy anything to train your dog. A sensible attitude and understanding of a dogs basic needs is more than enough. Say what you like about Cesar but he lives with a huge pack of dogs – who else can say that? If he doesnt know dogs then who does? I agree that his methods do not work for everybody but I can honestly say that I have two very happy balanced dogs due to using cesars methods right from the start. I have studied other training and felt cesars methods to be easy to implement with instant results. Thanks for sharing the latest on Merial and Caesar Milan. I have often thought the same thing you have – that Caesar has this “presence” thing about him that allows him to be successful in working with dogs (at least from what we are allowed to see after editing does it’s job). My concern has always been people trying to mimic what he does without REALLY knowing what they are doing. Too often I have seen people using his methods and putting themselves in danger. As far as what “A Pack Leader Says”, I disagree. This really IS NOT about profits. Otherwise, how do you explain Victoria Stilwell? This is about actual science, behavioral science. The University of Pennsylvania – Veterinary Medicine and Animal Behavior has done studies on methods used in training dogs. Guess what? Most of Caesar’s methods were shown to increase the likelihood of a dog bite, not reduce it. Guess which methods reduce the likelihood of a dog bite? Positive reinforcement methods. I think Caesar Milan has tons of presence and I think he has tons of charisma. I don’t hate him, I just think he’s misinformed and what works for him does not work for everyone else. And, I agree. You don’t need to have all the “things” stores sell to improve your dog’s behavior, but neither do you need to dominate them. I never have used Caesar’s methods, instead I’ve used positive reinforcement, and I’ve always had amazingly well-behaved pets. The link for The American College of Vet Behaviorists statement is dead. Could i please learn what was stated? With big fame, comes big criticism, this is the way of the world. Dr Ian Dunbar says…”He has nice dog skills, but from a scientific point of view, what he says is, well … different,” This is quoted by one of the most instrumental, meritorious professionals in the entire industry! For someone of this stature to say that CM has “nice dog skills” goes completely against everything that is stated in the article above. Do you think Mr. Dunbar thinks that CM is a bully who is cruel, abusive, uninformed, dangerously irresponsible and among MANY other ludicrous titles? BUT… Mr Dunbar is featured in CM last book and also is a very good friend with Martin Deeley. Mr Dunbar says, and I quote that ”Martin Deeley is one of the best dog trainers in the world”. He said this, while being interviewed on Bark Radio. Mr. Deeley works hand and hand with CM, on his show, in his web-site and in his books…do you think he also thinks so negatively of CM? I highly doubt it, these two and others, are the few realist professionals that concentrate their time to truly educate our community, rather then create web-sites, blogs and countless articles that bash, humiliate and undermine another person. Lets all STOP making this such a divided profession, by putting our pride, anger, animosity and many other harmful emotions aside and concentrate on one thing…THE DOGS! Ceasar Millian does say on his show, not to try any of his techniqes without consulting a profession. So people who try his techniqes and dogs who have been put down obvously didnt listen. Dogs domesticated from wolves right? What does a mother wolf and a mother dog do to there young when misbehaving? She will snap at them or growl them, telling them off or putting them into line. Thats all Ceasar is doing. Hes not hurting them, or abusing them. All he is done is given them a tap. His techiqes do work. As a dog traniner and owning 3 well behaviored german shepherds, his ways have worked for my dogs and others I help. So just because you think its wrong doesnt mean it is. You know how much I respect you as a person, and your works. There are people in this world whom contributions are “singular”, in that they’re unmatched, which makes them very precious. I come from a music world. Bill Evans is important, Oscar Peterson too. Impossible to tell which is better than the other. All we now know is that the world would be entirely different (at least the jazz scene), if either of the two didn’t showed their respective way. You are I believe, among these people Trisha. But Cesar Millan too, for some reasons. Even if just like Charlie Parker was in his days, CM is a bit controversial lol. Now as for the earth of your questioning, though I reckon this blog entry was posted in 2009, a year before Cafazzo 2010, and 8 (middle age) years after Coppinger Coppinger 2001. Its worth mentioning that it also came one year after Millan Bailey and Dunbar end up “agreeing” somehow on a number of issues (Dunbar and Millan are “that” close to finally define the notion of correction, and boy is it overdue. sorry for the “boy”). Which brings me to a few of his contribution, speaking of correction. Some day, some scientists did a fairly good job in meticulously studying the behavior of a rat, his responses, according to a simple paradigm. “We wait” for a rat to perform a behavior. And we either reinforce the ones we want to see happening again and punish the ones we want to eliminate. Oh cool lets drive on 30 years of clinical pratice on that. All right. Which brings me to contribution 2. He’s taught to live in the moment. What happened happened. Always be prepared to either, reinforce your dog (if you want him calm, love him when he’s calm, gotta be focused for that though, live in the moment). I will need to cut short, it’s just a blog comment. But his most fascinating contribution to me, the hidden one. The topic about which no one talks about. It has to be systematic use of inter specific interaction, as a means of rehabilitating red zone cases. Please, do not stop this guy from persisting, until science study heavily on that. Site is there. This is nothing short from amazing what he does. He his the most humble dog profesionnal on earth. He, would admit, not being able to do anything, without other animals. He’s used is superior knowledge of dominance in canis familaris, exactly as De Waal defined it in 87, for all these years, whilst most other high level professional would deny it. He would systematically present, the best possible candidate among his 30 dogs pack, as an introduction. Then you meet his lama. Then, and this is something that should speak loud to you. If you’re a shepherd. You will herd some sheeps. You will learn to protect. You will learn to gain confidence in yourself, and in the outside world, by finally, vibrating in harmony with your genetics. You will finally know, why you are there. You will feel good, as never ever before. You will learn that. With no progression. No prejudice. Your past is not important. We will live this moment together. You’ve killed 3 goats. I don’t care. However, try to nip one of my sheep, and I will teach you as if I was myself a dog, how to behave (body blocking, pushing away, and yes… nipping). The man, holds no responsability whatsoever toward human. He almost killed himself because of the human. All these judgments. He tries to avoid thinking about it. You mention something intersting in your entry. “He loves dogs”. Which yields the question. “Do dogs love him?”. If so why? At the heart of the pro vs con Millan, lies the answer. He holds no liability toward human. I’d say, he treats dog about 200% better, than they should treat themselves. So he has room… That’s how he thinks. He thinks we humanize our dogs. If you decided to post such a long comment, deep thanks as it felt really good writing it. I predicted that decade 2020-2030 should be the one when we will all agree, on dogs. There’s never any previous training at any step. A dog known for doing predatory attacks, or kills, will be exposed to chickens and small pigs. There’s not a single dog trainer that better tests, often with thresholds higher than the normal life. Huge focus put on 1) bringing the owners back into the scope, and 2) bringing the dyad back into the environment (processed in 2 different steps). I mean the list of things which he does perferctly, including a super mastery of the dominance concept. As shown on this clip, as presenting extra submissive and extra old. He never had to read Cafazzo to figure out that dogs, don’t bother the older. Etc etc etc etc.